I was hoping that both the surgeries I need in the near future - knee joint replacement surgery to fix the broken left knee joint from the accident, and brain surgery/craniotomy to debulk the brain tumor recurrence could be done together or back-to-back this week to make it convenient and easy for me and my family. Not happening. The surgeries will be spaced 2 to 3 weeks apart because of procedural and recovery reasons. First up is the Knee Joint Replacement surgery with Orthopedic Surgeon Dr. Gavin Bishop scheduled for tomorrow - Tuesday, July 3, 2018 - at 8:00 AM at Longs Peak Hospital in Longmont. 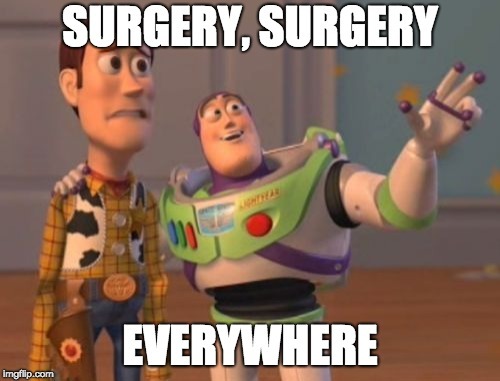 We are told it will be a day-surgery and I will be able to get home after the surgery around 1pm-ish in the afternoon. Based on Dr. Bishop's recommendation about recovery from the surgery, the brain surgery will be scheduled a few weeks after that. Neuro Surgeon Dr. Sharad Rajpal - who operated on my brain during my first surgery - is of the opinion that I should recover from my left knee surgery enough before going under the knife for brain tumor removal. The new tumor is very close to the motor cortex controlling motion on the right side of the body. If we are not very careful, I could end up with two bum legs - one from the leg surgery, and one from the brain surgery.